If you are looking for a reliable, accurate, child-friendly, and safe digital thermometer for your family, your search is over! Generation Guard's Clinical Forehead Thermometer is exactly what you need to keep you and your entire family covered against the flu and fever. With its most accurate hospital grade temperature reading, you can now take temperatures like an ER nurse and have the technology at hand of a medical clinic right in your own home. Our superior refined microchip and highly sensitive infrared sensor allows consistent no touch forehead and temple scanning without hassle. Perfect for babies, children, and adults. INSTANT ACCURACY: In just ONE second, you can take body temperature with confidence thanks to its advanced infrared temperature sensor with high sensitivity. 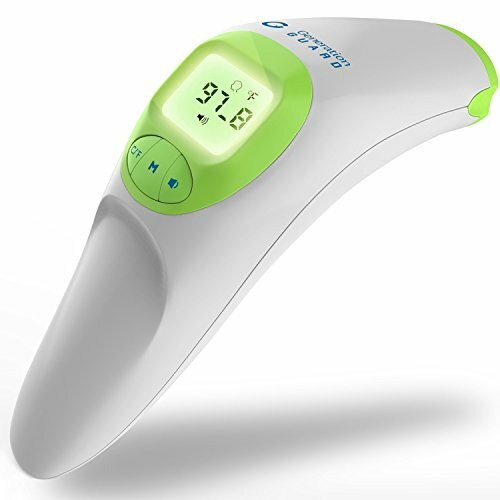 100% SAFE FOR FAMILY: Have peace of mind cause our no contact thermometer is FDA approved, thoroughly and clinically tested. DOUBLE UNIT MEASUREMENT: With our innovative medical device, you can measure in Fahrenheit and Celsius and switch between the units so easily. VERSATILE USE: Our infrared thermometer is multi-purpose for effective and reliable body, room, and bottle temperature reading. EASY OPERATION: With its non invasive and handheld design, our product is more hygienic, less threatening for children, and so much easier to use with sleeping babies. QUIET MODE: The thermometer includes a feature which allows quiet scanning without loud beep so as to not disturb your sleeping child. Clinical Forehead Thermometers purchased from Generation Guard come with a 30 day money back guarantee. If you have any questions about this product by Generation Guard, contact us by completing and submitting the form below. If you are looking for a specif part number, please include it with your message.